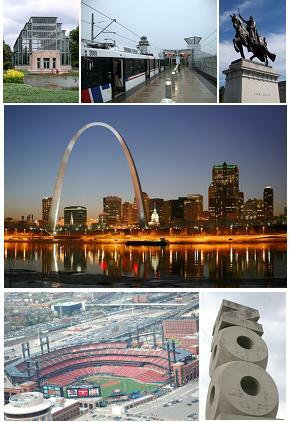 Saint Louis (Missouri) - Wikipedia, entziklopedia askea. Saint Louis Ameriketako Estatu Batuetako Missouri estatuko hiririk garrantzitsuenetako bat da, Missouriko bigarren hiririk garrantzitsuena da alegia. Gaur egun 350.800 biztanle inguru ditu hiriak. Hiri honen ikur ezagunenetakoa Gateway Arch da. ↑ Climatological Information for St. Louis, United States Hong Kong Observatory . Noiz kontsultatua: 23 January 2011 . ↑ Heat Wave Smashing Records, Topping 100 Degrees AccuWeather . Noiz kontsultatua: 29 June 2012 . ↑ a b c d e f g h i j k l m n St. Louis Sister Cities St. Louis Center for International Relations . Noiz kontsultatua: 2008-05-19 . ↑ a b c d e f g h i j k l m n o p (Ingelesez) Sister Cities International, . Noiz kontsultatua: 2018-08-13 . ↑ a b c d e f g h i j k l m n o (Ingelesez) World Trade Center - St. Louis, . Noiz kontsultatua: 2018-08-14 . ↑ (Alemanez) Offizielles Internetangebot der Stadt Stuttgart, . Noiz kontsultatua: 2018-08-14 . ↑ (Polonieraz) BIP Szczecin - Urząd Miasta Szczecin, . Noiz kontsultatua: 2018-08-14 . Orriaren azken aldaketa: 10 abendua 2018, 09:36.